Learn how to incorporate Sei Bella into your business and help your friends express their true beauty. Hosting a Sei Bella Beauty Event is all about helping your guests express their own beauty and confidence. Many women don’t know enough about skin care and makeup to truly care for their skin. 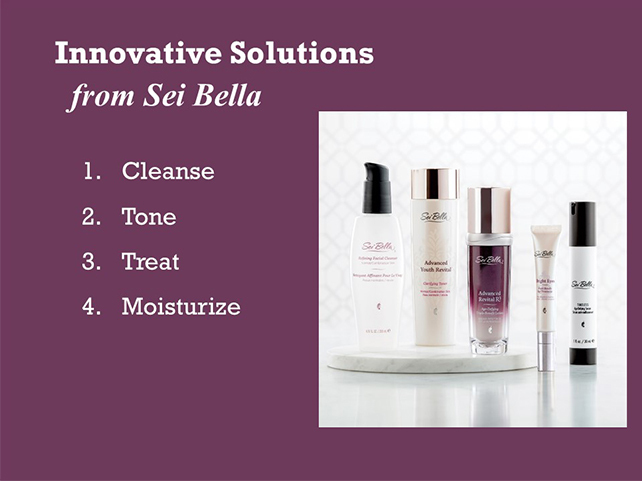 By introducing them to Sei Bella, you’re giving your guests the knowledge and products they need to enjoy a lifetime of beautiful skin. Use the checklist below to help you get ready for this fun social event. Or view our more complete checklist here. Prepare your home and have fun! Getting your party started is easy. Download and print your invitations, address them and add a cheerful personalized note, then get them in the mail. The day before your event, call your guests to remind them and extend a personal invitation. mail them out to your guests. Download and familiarize yourself with the following presentation—Discovering Sei Bella. Read up on your favorite Tips & Tricks and work those into your presentation. 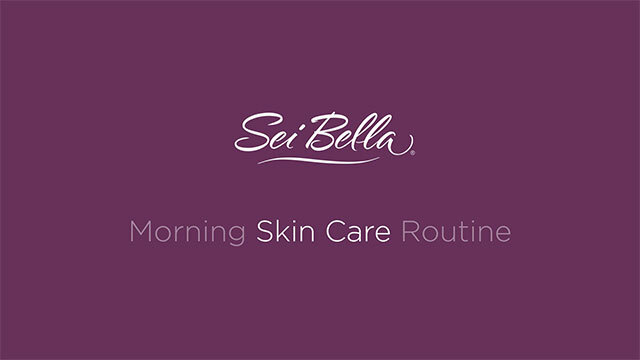 Discovers Sei Bella’s approach to beauty with skin care, color cosmetics, and hair care. Sei Bella, translated from Italian, means "you are beautiful". So what is our role? To help each of our customers find the right products, the right color to enhance her natural beauty. 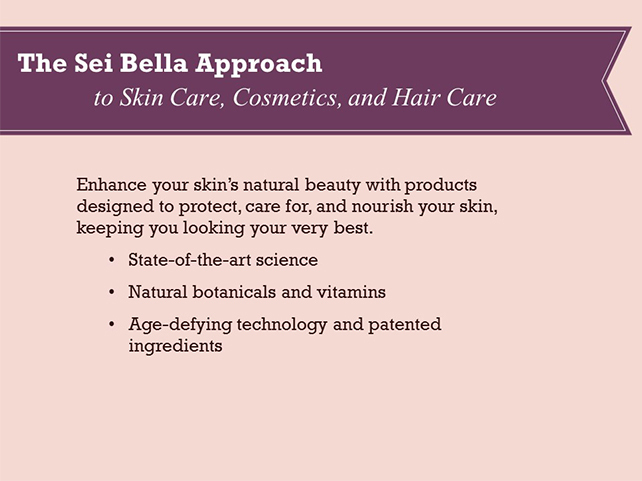 Sei Bella offers a total approach to beauty with premium products and superior results. Additional ingredients and technologies include: MaxiLip in our Plump Lip Gloss, Filling Spheres on Lip Color, Crème to Powder and Mineral Foundation, Pressed Powder, Loose Powder, and many more beneficial ingredients. Daily life takes its toll on skin, but that doesn’t mean nothing can be done to preserve skin’s natural radiance and health. Every day, facial skin gets coated with a layer of dirt, pollution, natural oils, and often makeup. The combination of these elements creates grime that settles into the skin, leading to oversized, clogged pores, blemishes, and an unbalanced complexion. Removing this residue is an essential part of everyday skin health. The face needs to be washed and toned both morning and night—whether or not one wears makeup—to keep your complexion clear and skin glowing. The best skin care will do more than simply remove dirt and impurities, it will also nourish and strengthen skin with beneficial ingredients. Exposure to the elements disrupts skin natural moisture balance. The right kind of moisturizer balances out the skin's natural oil levels to maintain hydration and keep skin feeling soft and supple. Dehydrated skin is faster to show fine lines and wrinkles, so daily moisturizing is important to keep skin looking its best. A good moisturizer also creates a barrier between the skin and the rest of the world for extra protection against the environment. It should also include SPF protection to help prevent premature photo-aging. Daily exposure to the sun causes 90% of the external signs of aging. Experts agree that when it comes to skin, sun is the #1 enemy. The sun emits 2 types of ultraviolet light waves, UVA and UVB rays. Both of these rays can damage the skin and generate free radicals and inflammation. Protecting the skin from both of these harmful rays is essential to long-lasting skin health. The daily use of an SPF is the only way to protect skin and keep it youthful-looking. Sei Bella Moisturizers helps protect skin from sun damage with broad-spectrum SPF 25, as well as topical antioxidants and peptides. 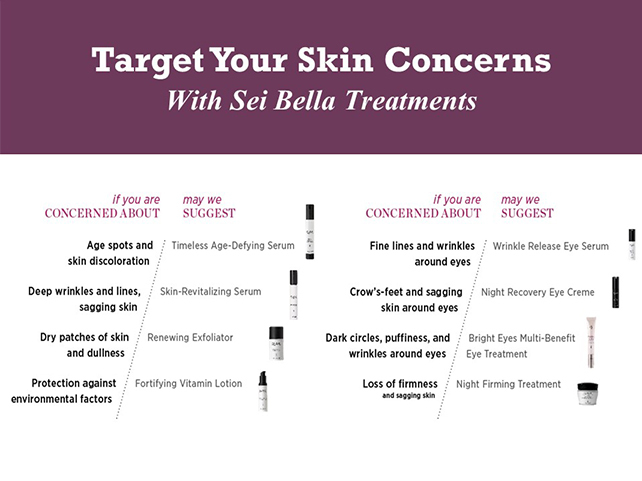 Sei Bella provides powerful solutions specifically targeted to your unique skin type. Beauty Basics really do start with great skin care. The first step in selecting the products that fit your personal needs is to identify your skin type. There is a printable worksheet on Melaleuca.com/seibellatips that you can use for yourself and your team. Most people don’t know in what order they should use their skin care products. Removes makeup, oil, and bacteria that can lead to blemishes, clogged pores, fine lines, and the signs of premature aging. If you use a mask, you should do so after cleansing. Removes traces of makeup and cleanser while depositing age-defying ingredients and moisture. Most importantly, toner will prepare your skin to absorb beneficial ingredients in the treatments and moisturizer you apply afterward. Targets area of concern with powerful antiaging ingredients. Treatments can lessen the look of lines and wrinkles and boost radiance and help tighten sagging skin. Apply treatments from lightest to heaviest (i.e. serum and then crème). Apply as the last step of your regimen, whether morning or night. Moisturizer not only hydrates skin but creates a moisture seal to keep beneficial ingredients from treatments in while blocking out pollutants from the environment. In addition to the specialty ingredient featured in each formula, all Advanced Youth Revital™ Toners and Advanced Revital R3™ Age-Defying Triple-Benefit Moisturizers feature a unique combination of clinically proven ingredients that reduce the signs of aging and but also prevent future and signs of aging. Primary Benefit: Moisturizes dry skin while washing away dirt and makeup. Primary Benefit: Controls oil while washing away dirt and makeup. Primary Benefit: Hydrates skin, removes trace impurities, and reduces the appearance of pores for more radiant, youthful-looking skin in just four weeks. Primary Benefit: Clarifies skin, removes excess oil, and reduces the appearance of pores for more radiant, youthful-looking skin in just four weeks. Primary Benefit: Deeply hydrates skin, prevents future moisture loss, PLUS reduces the appearance of fine lines and wrinkles in just four weeks. Primary Benefit: Provides lasting hydration without greasy residue, PLUS reduces the appearance of fine lines and wrinkles in just four weeks. 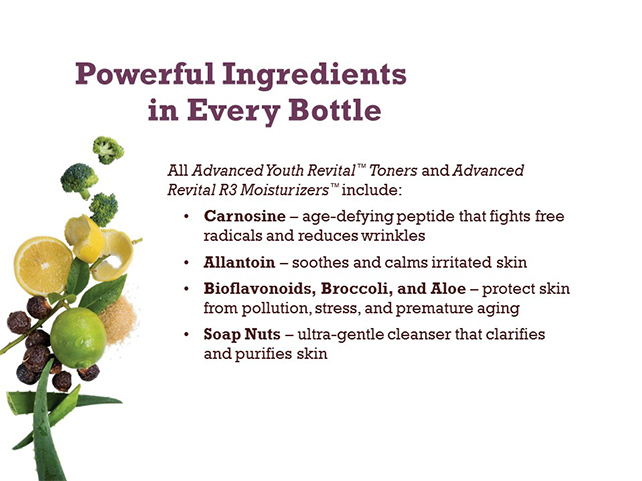 In addition to the specialty ingredient featured in each formula, all Advanced Youth Revital Toners and Advanced Revital R3 Moisturizers feature a unique combination of clinically proven ingredients that reduce the signs of aging and but also prevent future and signs of aging. 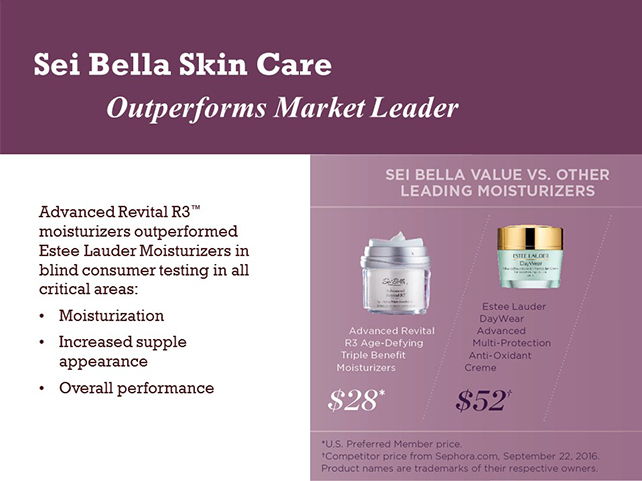 More people said they would purchase Advanced Revital Revital R3 Age-Defying Triple-Benefit Moisturizers when compared to both the Estee Lauder moisturizers and their current department store moisturizer. Every skin treatment is designed with a particular need in mind. Use this chart to find the products that help your specific skin concerns. 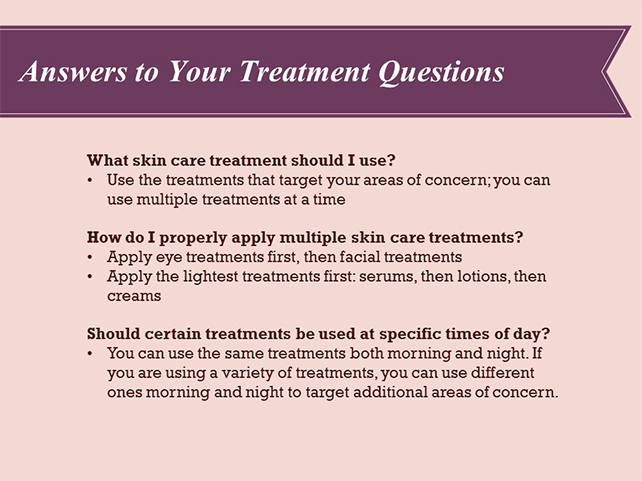 There are some common questions that often arise related to skin care treatments. Let’s review some now. What skin care treatment should I use? Use the treatments that target the areas you are concerned with. You may use multiple treatments, but you probably won’t need to use all of them at the same time. 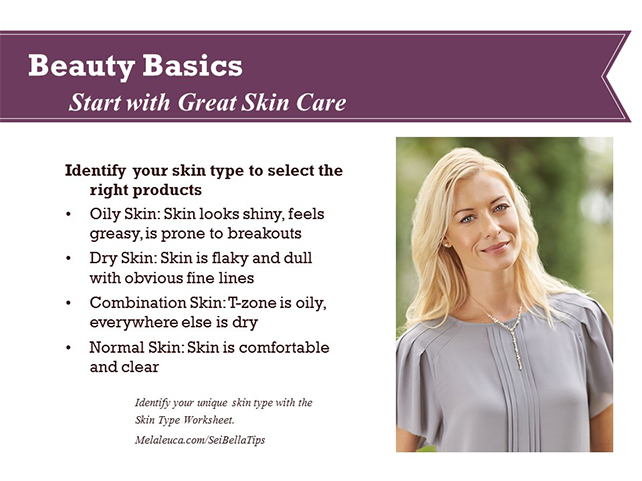 There is a quick guide in the Fall Sei Bella catalog as well as a PDF online that suggests products based on your skin care concerns. This is a helpful tool when hosting your Si Bella events. How do I properly apply multiple skin care treatments at a time? Apply eye treatment first, then follow with your facial treatment(s). You can layer more than one treatment. Apply the lightest treatments first, serums, followed by lotions, then creams. This goes for morning or nighttime application. Make sure your daytime moisturizer has SPF. Apply some treatments in the morning and some at night. You can rotate treatments, or use them seasonally. Renewing Exfoliator is perfect to use as the seasons change, most people’s skin gets a little dry adjusting to the humidity and temperature change. Should certain treatments be used at specific times of day? You could use the same treatments both morning and night or use different treatments at night to target additional areas of concern. If you have sensitive skin, Fortifying Vitamin Lotion and Renewing Exfoliator are best used at night since sunlight can cause additional irritation on recently exfoliated skin. 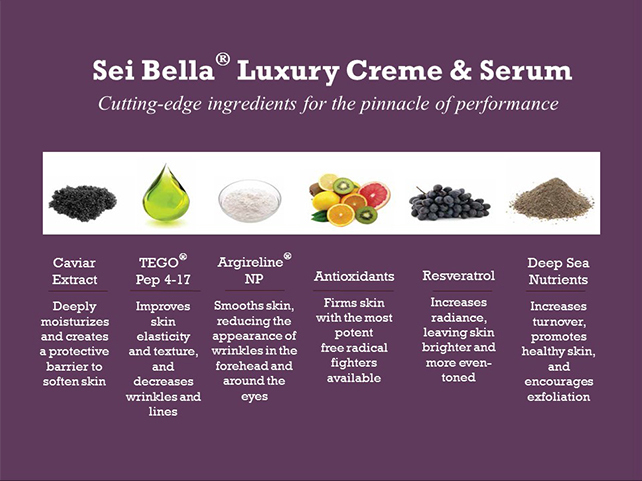 Sei Bella Luxury Cream is the most premier blend of natural ingredients, highly engineered peptides, lipids, and bioavailable vitamins. It is clinically proven to deliver visible, astonishing results in just 28 days! No expense was spared in the creation of this luxury crème. Luxury Crème Concentrate – Rich anti-aging moisturizer amplifies your skins natural restorative functions while the body rests. Use at night. 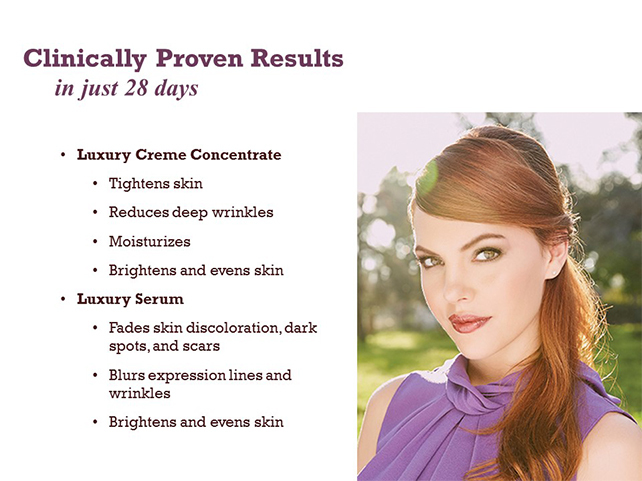 Luxury Serum – Lightweight serum penetrates below the skins surface to restore the natural functions of skin. Use day or night under a moisturizer. 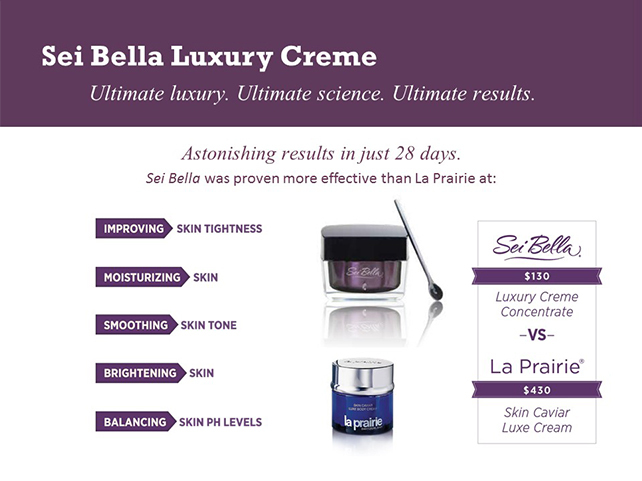 In clinical studies, after just 28 days, Sei Bella Luxury Crème outperformed La Prairie Skin Caviar Luxe Cream in all 5 critical age-defying factors including: Improving Skin Tightness, Moisturizing Skin, Smoothing Skin Tone, Brightening Skin, and Balancing Skin PH Levels. This product is amazing, it is literally the best age-defying product on the market. You could build your entire business on this product. We are seeing dramatic results from customers in our business (presenter, share your personal experience and those in your organization). Beauty is something you create, defined by your own unique sense of style and fashion. Sei Bella skin care products set the stage for you to express yourself with color. Color Cosmetics is a $9 Billion industry in the US, which confirms that women really enjoy wearing makeup. Makeup is a way many of us express our own unique heritage and enhance our natural beauty. 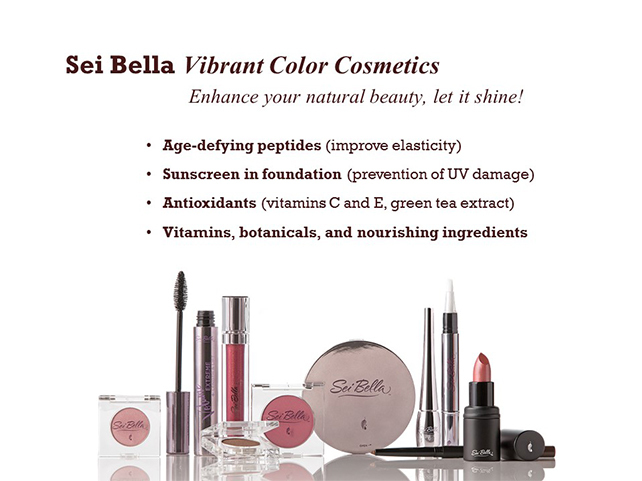 At Sei Bella, our cosmetics are formulated with natural ingredients to deliver vibrant colors and shades – but also that go on smoothly. They are formulated to be good for you – so you look great and feel confident. 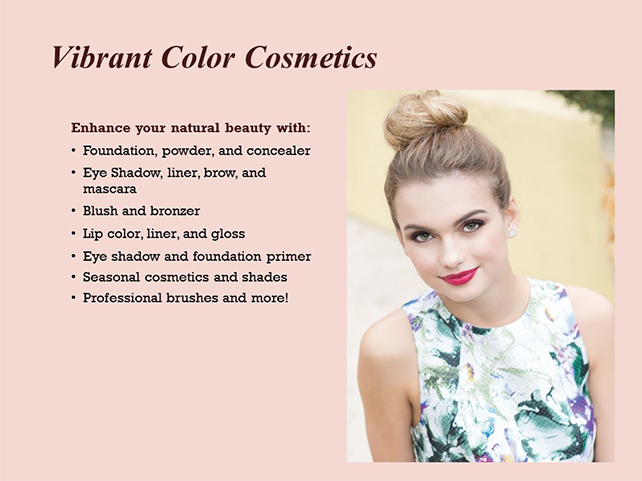 One of the things that makes Sei Bella color cosmetic products so good is the breadth of products that we are able to offer to meet your needs. Sei Bella Liquid Foundation will effortlessly smooth your complexion and evens skin tone, while actually protecting and beautifying your skin! OPTIONAL: Sei Bella helps you create a flawless foundation for the rest of your makeup by using foundation primer, foundation, concealers, powders, and bronzer. Ranging from light to heavy coverage, they offers several different foundation formulas for your skin’s needs. With dozens of blendable colors you can find your perfect match. You can try all of these forms and colors today. 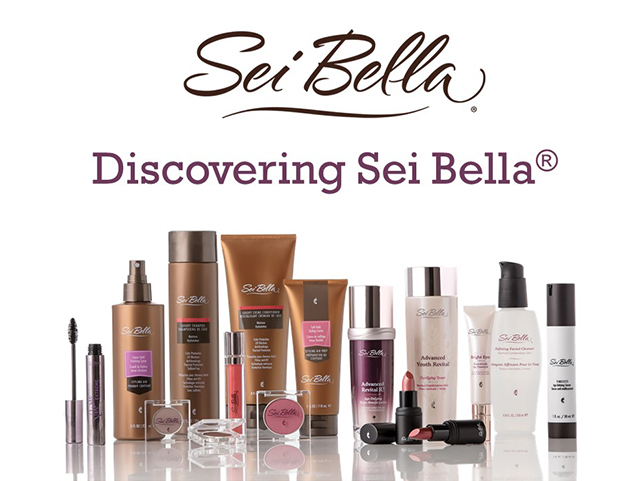 Check out the Sei Bella Catalog for helpful information on choosing the foundation coverage that is right for you. Sei Bella Defining Lash Mascara takes your lashes to new lengths with ultimate definition with the molded, curved brush. And depending on your needs – it comes in waterproof and regular. The Volume Extreme Length and Lift Mascara nourishes and strengthens lashes while helping them grow thicker and longer. It provides extreme volume while lengthening and lifting your lashes for a full, voluminous look. Enhance Eye Shadow - available in 35 colors – provide everlasting color without fading, flaking, smudging or creasing, but the best part: vitamins and botanicals provide long term benefits and improve the appearance of skin! Lip Gloss, Lip Plump, & Lip Color – available in a total of 33 shades – contain powerful antioxidants like green tea and vitamins A, C, & E, plus Shea butter and safflower oil to moisturize and smooth lips. And filling spheres reduce the appearance of lines for a smooth finish. 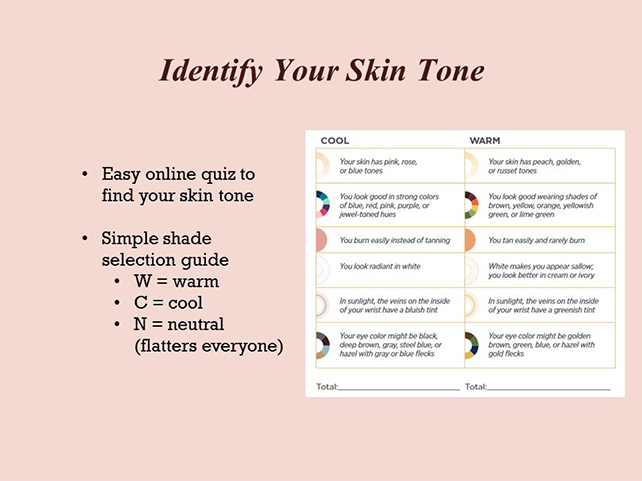 It’s important for you to know your skin tones. This makes selecting colors a breeze. There is a quiz online that help determine this with 6 simple questions. 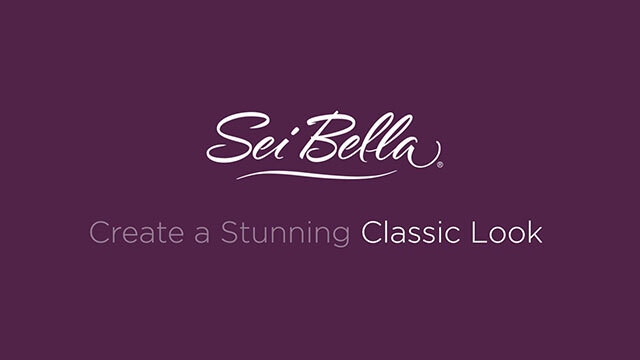 Sei Bella identified all of their cosmetic shades as Warm, Cool, and Neutral to make shade selection effortless. As you can see our products are better than the big name competition. We have better technology, better products—and better value. We don’t spend thousands of dollars on traditional advertising, so we're able to pass the savings on to you by delivering cutting-edge beauty technology at a price that’s lower than our competitors. 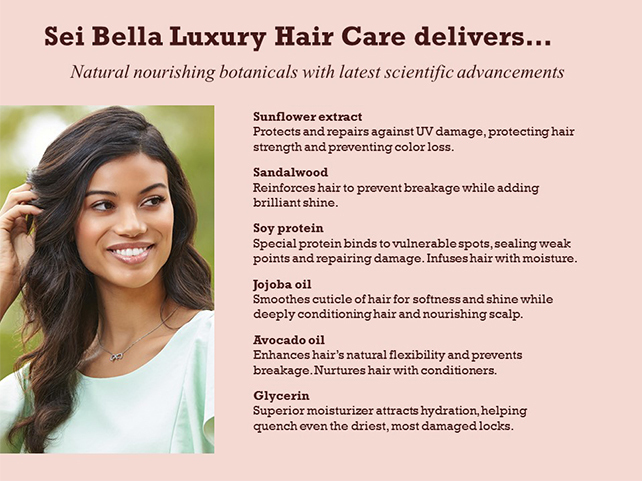 For Melaleuca, this provided opportunity to be first in the market – a line of luxury hair products that brought together all benefits consumers are looking for in one product – Sei Bella Luxury Hair Care. Hair Care is a $10 Billion Industry. Using clinically tested ingredients, Sei Bella Luxury Shampoos and Crème conditioners deliver visible results for softer, shiner, more manageable hair. 4 benefits in 1 provide convenience and value. The four benefits include: Color Protection, Thermal Protection, UV Protection, and Anti-Breakage Protection. 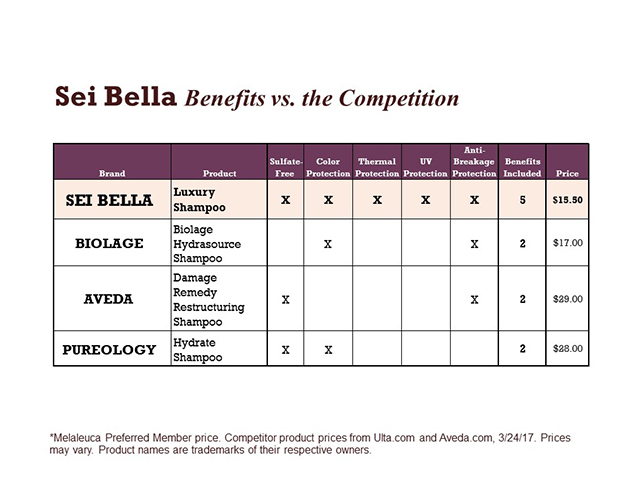 It takes 4 different Biolage products to get the same results you get from one Sei Bella Shampoo. Additionally, Sei Bella Shampoo and Condition went hear-to-head with Pureology (a brand known for its color protection) and outperformed them in 2 different clinical tests: Color Wash Fastness and Thermal Protection. In the next few slides I will show you a comparison of leading salon brands vs Sei Bella Shampoos. Sei Bella Luxury Hair Care offers formula variety so you can get the customized experience that you need. And of course our hair care is sulfate free. 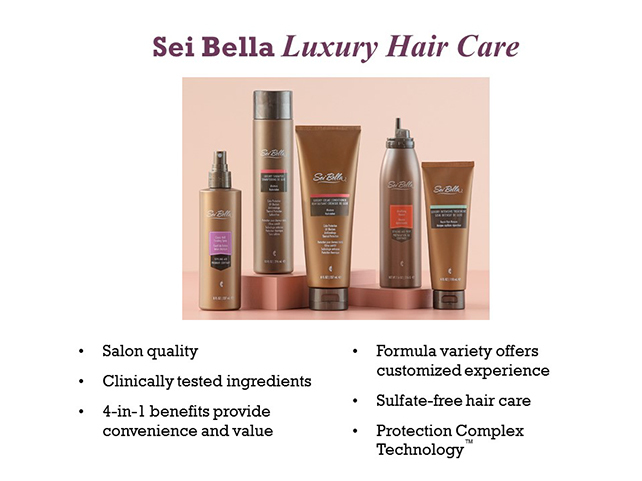 Every Sei Bella Shampoo formula cares for your hair with gentle, sulfate-free cleansers and the Protection Complex technology, they offer a variety of different cleansing and conditioning benefits to meet your unique needs: Volumizing, Moisturizing, and Ultra Moisturizing. Everyday hair is confronted by an onslaught of damage – from friction of sleeping on a pillow to heat styling to oxidation from the sun. Your best defense is good protection. Sei Bella Hair Care Daily Treatments help prevent damage including: fortifying hair against breakage, and protect hair from styling and environmental damages. Sulfate-free hair care products are gentler on hair. Instead of weakening and damaging hair, sulfate-free reinforce the cuticle of each strand, protecting the cortex and strengthening your hair overall. It protects hair with three critical benefits – color fading, moisture loss and helping to reduce breakage. The result – healthy hair that is soft, manageable hair that shines with strength. Sulfates are not unsafe, they are just not healthy for your hair. Sulfates are the primary cleaning agents found in most shampoos. While sulfates do a good job of cleaning, which is why they lather so well, they can damage your hair, leaving it dry and brittle. Many sulfate-based shampoos strip away essential moisture and cause color-treated hair to fade sooner. This weakens the hair, causing it to break more easily (split-ends) and limits the hair's ability to reflect light, making it look dull and unhealthy. Naturally nourishing botanicals work in harmony with the latest scientific advancements to bring gentle, replenishing hair care products. Here are just a few of the many botanicals infusions that are part of the unique Protection Complex Technology. Sunflower extract, soy protein, sandalwood, and more botanicals like jojoba, avocado and coconut oils and glycerin. 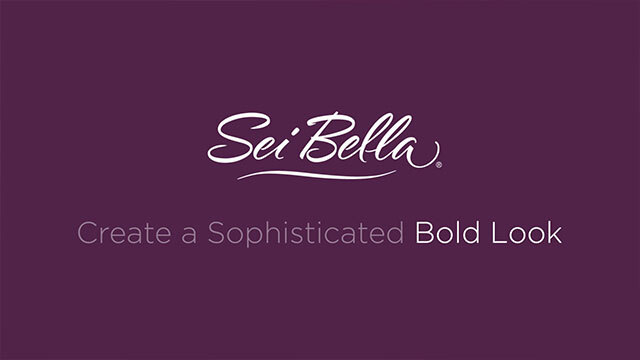 The opportunity to extend Sei Bella in Luxury Hair care was identified when we looked at the premium hair care segment. Here’s a matrix for the premium hair care segment. We’ve arrayed products by benefit area across the top starting with sulfate free, color protection, thermal protection, UV protection, and anti-breakage. The premium segment is where brands offer their best science, their latest and greatest. As you can see, Sei Bella is the only single product that offers all of the benefits consumers are looking for in a shampoo. What’s interesting about this segment, is that, most brands offer one or two benefits in a bottle. No one besides Sei Bella offers UV protection as a primary benefit in the shampoos. In order to get all these benefits, you’d have to buy 3 or 4 different bottles of shampoo. That could easily cost you in excess of $70-$80. We started the process of developing a premium line of hair care several years before it launched. Our objective was to deliver the most sought after benefits, the ones consumers want most, in one product. 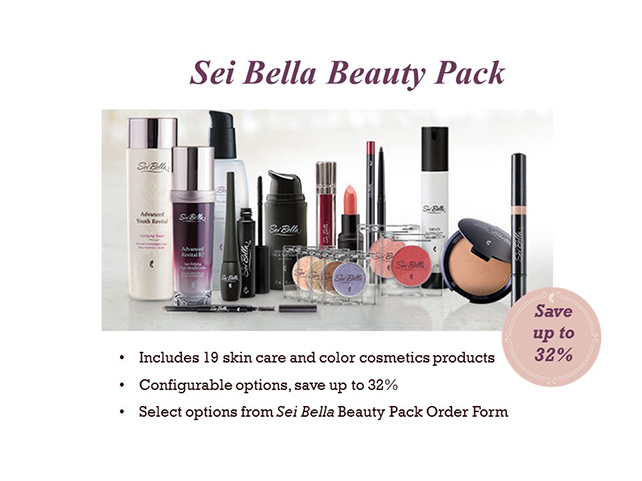 The Sei Bella Beauty Pack includes an assortment of 19 Sei Bella Skin Care and Color Cosmetics at up to a 32% savings*. It is the perfect way to get started with Sei Bella. 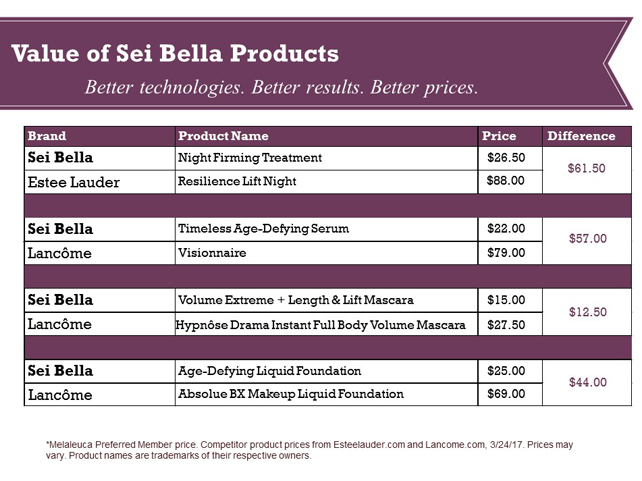 Your host has a Sei Bella Beauty Pack Selection sheet, it makes ordering your Beauty Pack easy. 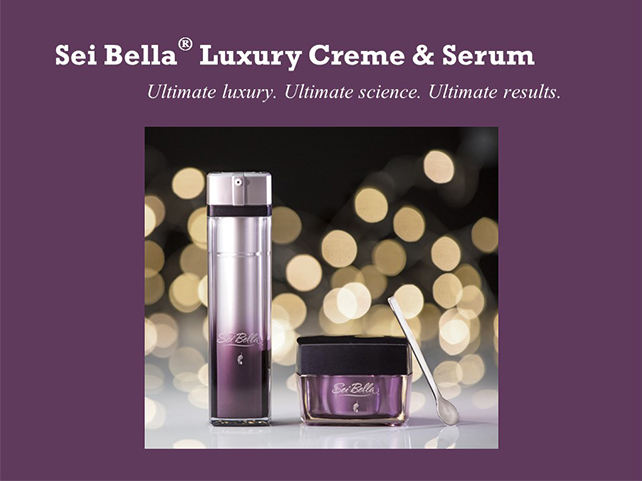 You can use the Sei Bella Catalog, Website, and samples from your host to select the Skin Care and Cosmetics that are right for you. Mark your selections, then place your order at home by calling 1-800-282-3000 or by visiting www.Melaleuca.com. Item Number 2752. Additionally, if you are interesting in hosting your own Sei Bella events this pack if the perfect way for you as a host to purchase your products for display and sampling at your events. *Savings amount is dependent on which Skin Care Treatments Customer selects. 100% Satisfaction Guarantee – Perhaps the best tool we have for sampling is Melaleuca’s 100% Satisfaction Guarantee – you can try any product risk free. Even if there is nothing wrong with the product, you simply chose a color that you decided you didn’t like, you can return it! And we offer phenomenal products at 30-40% Less Than Department Store Products. Skin Care, Cosmetics, and Hair Care can be a lot of fun—but they can also be confusing. Once women understand what colors are right for them and how to use makeup, confidence sets in and they can really enjoy experimenting with color. 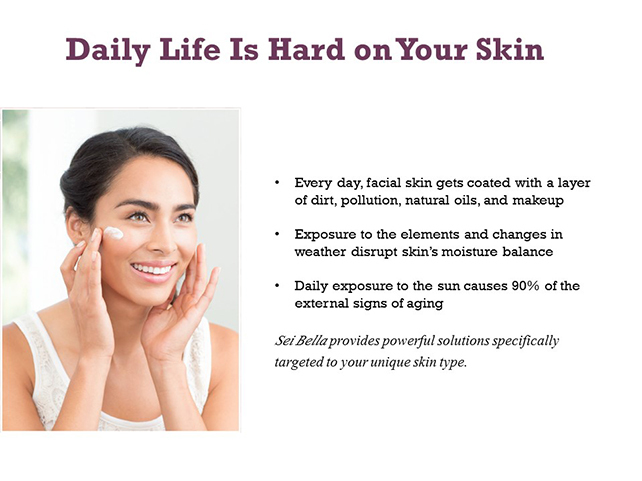 Sei Bella provides a variety of ways to learn and teach about Skin Care, Cosmetics, and Hair Care. 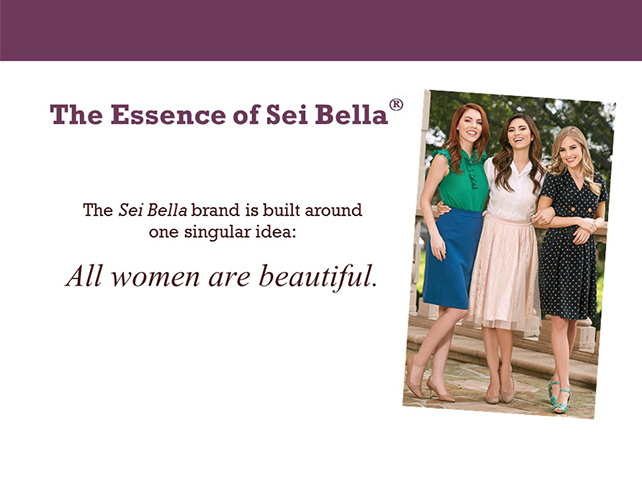 The Sei Bella Catalog is one of the most convenient tools for educating yourself. All of the skin care products feature a primary benefit statement which makes selecting the right products so easy, for instance evening skin tone or minimizing crows feet. It also includes shade swatches for all cosmetics, including the foundation swatches which are located on the edge of the page, so helping your customers find their perfect shade match is so easy. It is filled with tips for selecting colors, quizzes, and so much more. I can’t emphasize enough how important it is to provide you and your customers with all of the tools necessary to personalize the products to fit your beauty needs. 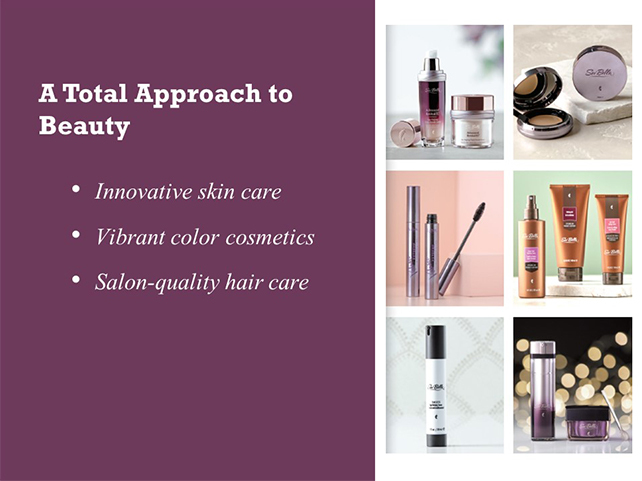 The catalog is updated 3 times per year, and there is a website section dedicated to providing tips and tricks on skin care and color cosmetics. It is constantly being updated with new information and tools that will help you in building your business. 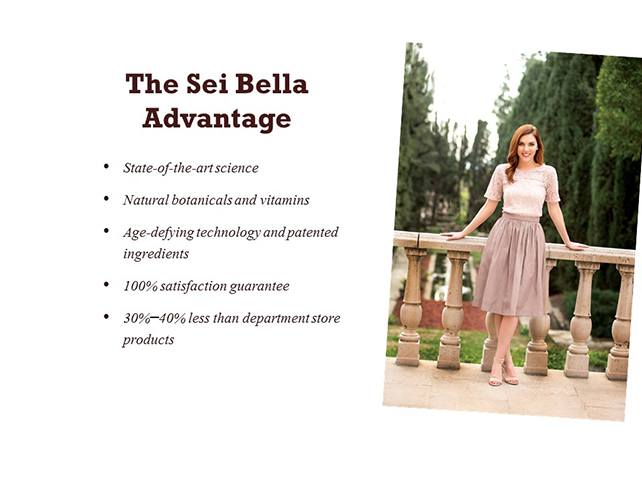 Plus there are new Sei Bella Specials available online EVERY MONTH, making it easy and exciting for your customers to try new Sei Bella Products. Who doesn’t love a great deal? 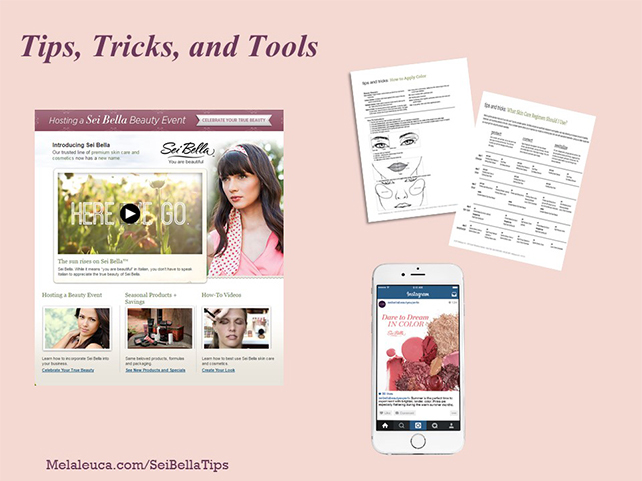 The website features business building tools including materials for hosting your own Sei Bella Beauty Event. 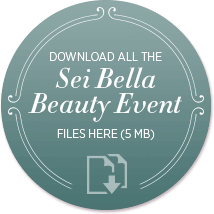 We offer various tools to make your Sei Bella Beauty Event easy and successful like printable invitations, a preparation checklist, videos you can use, printouts, quizzes, and much more. Explore these links to see all the ways you can customize your event. These videos will help you understand what makes Sei Bella unique. 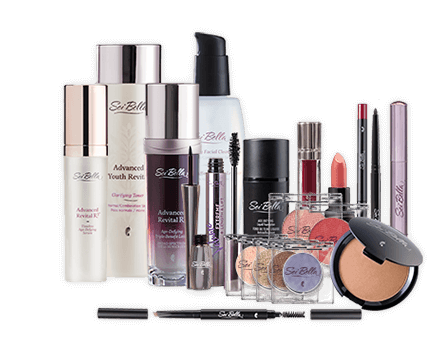 The Sei Bella Beauty Pack offers a sampling of our most popular products so you can experience the benefits of Sei Bella Skin Care and Cosmetics — all at an exceptional value. It’s the perfect way to convert your beauty regimen and to enhance your skin’s natural beauty with products designed to protect, care for, and nourish your skin, keep you looking your very best. 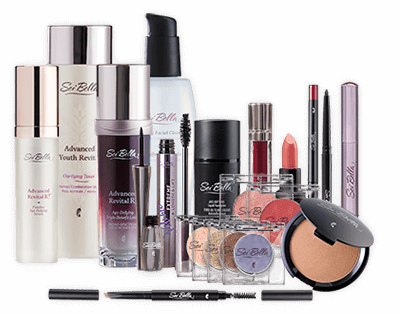 The Sei Bella Beauty Pack includes 19 different items.